These days we're all bombarded with photographs from the internet many of which seem too good to be true. Many of them aren't true. But I can vouch for this one taken on the M4 in the Western Suburbs of Sydney last Friday. No, the Museum of Fire---actually a museum of fire fighting---wasn't burning down but a warehouse nearby was. Fortunately, there were no deaths or injuries. 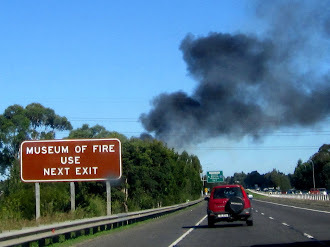 My good friend and fellow author, Richard Tulloch, and I were driving back to Sydney from a bushwalk in the Blue Mountains when we saw smoke from the fire and then the seemingly-appropriate sign. Sadly our serious cameras were in the boot of the car and there was nowhere to pull over to get to them but I managed to get out my pocket camera (I was driving) and handed it to Richard who snapped this photo. The moral is: always have a camera with you, especially if you're feeding a hungry blog. I could never be a nature photographer. I'm just not patient enough to wait in a hide at night for a mother Eurasian Eagle Owl to return to the nest with a freshly-killed mouse, or to crawl around a malarial swamp photographing the mating habits of a False Gharial, or to spend my life searching for last living Night Parrot or Tasmanian Tiger. But I do walk a bit both here in Australia or wherever I might be and I often have Canny the 3rd, my trusty pocket camera, with me. While I could never work for David Attenborough I've had my share of the gadget-bag essential---good luck. 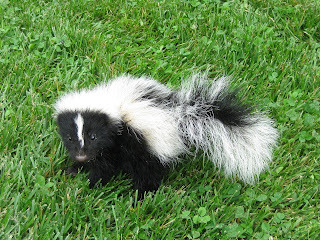 I was with some birdwatcher friends in their backyard in Massachusetts and, while their binoculars were trained on their bird-feeder, I looked down on the ground and saw this baby Striped Skunk. It let me get very close before raising its tail and running away. Fortunately it was too young to spray me. 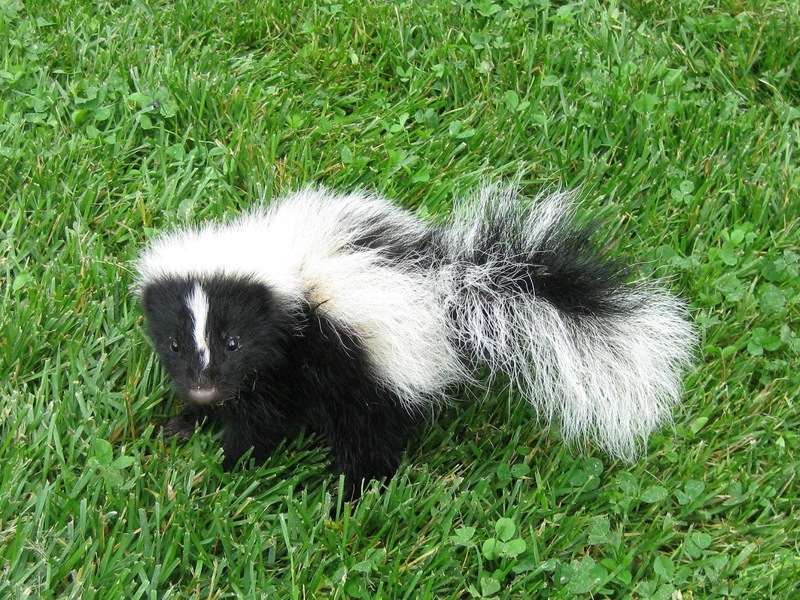 It was incredibly cute, as I hope you'll agree, but not old enough to make scents. These Rainbow Lorikeets were in a park near where I live in Sydney. They let me get very close before flying away. They are very common but so strikingly colourful that I can never resist photographing them when they give me a chance. This New Zealand Fur Seal was warming up on the rocks at Kaikoura on the South Island of New Zealand. Its mother, behind me, wasn't as happy about my informal photo-shoot. She made a quick movement towards my legs and I legged it very quickly out of bite-range. While I was walking on a country road in Maine some young relatives of mine called me over to their backyard. They showed me these baby North American Raccoons in a hollowed out apple tree. Once again, I had a camera in hand---rather, in pocket. Royal Spoonbills are not uncommon here in eastern Australia. 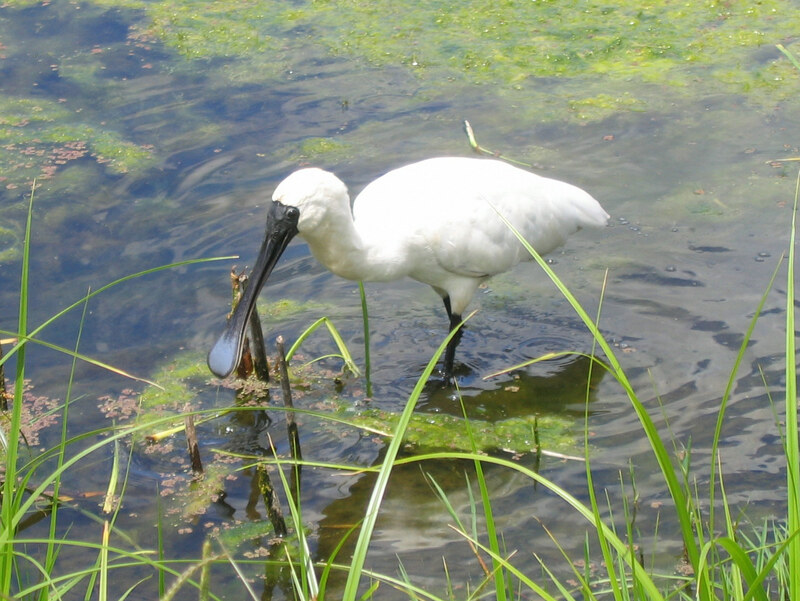 This one was in a park near me rummaging through the water plants in a pond and allowed me to get close to it before it flew over to the other side of the pond. It was clearly annoyed that I'd interrupted its dinner. I can't claim this photo as my own. 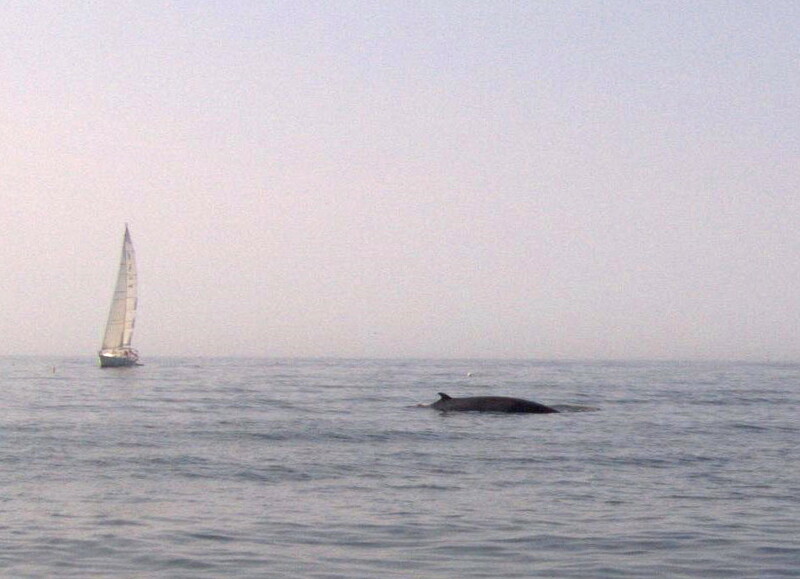 Near Boothbay Harbor, Maine, this whale suddenly surfaced. I was at the helm of the boat and quickly cut the engine. I couldn't get to my camera in time but my cousin, Johnny, obligingly took this photo. 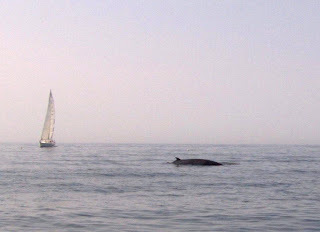 We thought it was a Minke Whale but this is all we saw of it. It dived and we didn't see it again. 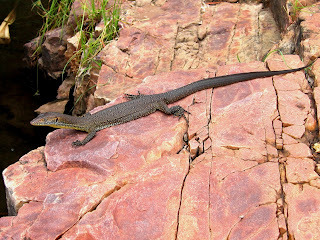 On another boat, this time on a trip up the Ord River near Kununurra, in northmost Western Australia, this lizard was sunning itself. I don't know what kind it was but it was big, fast and loved the water. If you know what it is, please leave a comment. 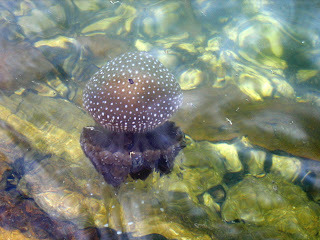 I was walking around Iron Cove on Sydney Harbour when I spotted this Australian Spotted Jellyfish. They're common here but I'd never seen one before. Jellyfish don't race away when you try to photograph them which is fortunate as it took a while to get a photo that didn't show the clouds above better than the jellyfish itself. 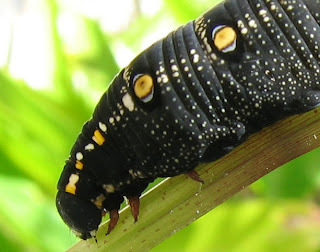 Closer to home, this sausage-size caterpillar (species unknown) appeared in our tiny back garden. I watched it for a while carving great chunks out of some of our favourite plants. I'd have loved to see whether it eventually turned into a butterfly or a moth but by then we wouldn't have any garden left. So I took it for a walk to the park where it would have more to eat. I can't identify it so if anyone can, please leave a comment. 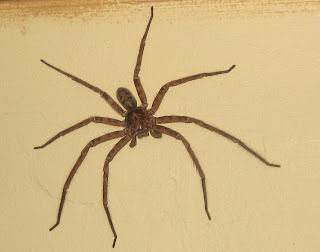 Huntsman Spiders make guest appearances in our houses here in Sydney. They don't actually come in to the house but just magically appear inside on a wall or ceiling. Their bite isn't deadly but they can bite and they are memorable to look at. This one is the span of a child's hand. Okay, a smallish child's hand. They have two speeds: deathly still and frighteningly fast. I'm the designated spider-catcher-in-chief because I'm not quite as terrified of huge spiders as my wife is. I use the bowl and magazine method and then release them in the park across the street closer to the neighbours' houses. Huntsmen (Huntsmans?) aren't always easy to catch. Just when I'm about to clap the bowl over them they often shoot off. Perhaps the screams of, "Catch it, Duncan! Catch it! Get it out of here! Oh, yuck! Horrible. Horrible." disturbs them. If you enjoy this blog, why not subscribe? Just put your email address where it says FOLLOW BY EMAIL at the top right of this page and you'll be sent an email to confirm that you want it. You can always unsubscribe if it gets boring..
Why do they speak Spanish in most of the countries of South America except Brazil where they speak Portuguese? I found the answer quite by accident in Tordesillas in Spain. We were driving from Galicia in northwestern Spain to Madrid in the centre. It was getting late when we arrived in this town so we decided to spend the night. At our hotel they told us that it was the day of the annual celebration the Treaty of Tordesillas. We hurried to the main square and watched a re-enactment of the signing of this famous treaty in 1494. In the late Sixteenth Century, Spanish and Portuguese explorers were sailing around the world searching for a water route to India and claiming the lands that they found in the process. Christopher Columbus had just snapped up various islands in the Caribbean and the Portuguese and the Spaniards were madly mapping the coastline of the New World. Instead of fighting over these newly-discovered lands, King John II of Portugal and the king and queen of this part of Spain---Castile and Aragon---made a deal. They would draw a line on a map from north to south through South America. Portugal would get everything east of it that hadn't already been claimed and Spain would get everything to the west of it. This gave what is now the coast of Brazil to Portugal and almost everything else to Spain. Not a great deal for Portugal and maybe this was because the pope, who had been born in Spain, was in on the negotiations. We got to the middle of town just ahead of the troops of the Ferdinand and Isabella, the Spanish king and queen. Then along came the striped soldiers of the representatives of Pope Alexander VI. Followed by the the troops of King John II of Portugal. They assembled in the main square, the Plaza Mayor, while the present mayor (with her back to us in the picture below) read out the proclamation of the Treaty. We listened respectfully, not understanding much of the mediaeval Spanish. Towns and cities around the world have their celebrations but this one was especially fun for us because we'd happened on it by accident, because it was such a friendly atmosphere and because we seemed to be the only out-of-towners. It's rare to be the only tourists at an event like this. And we actually learned something. The one thing missing were South Americans. This was probably not surprising since this was a celebration of the carve-up of their continent by a bunch of greedy foreigners.